Join me for 8 nights and 9 days exploring beautiful and historic Northern Dalmatia, one of Croatia’s most stunning and scenic destinations. No previous paddling experience needed. Nearly a quarter of the way from the Croatian to the Italian coastline, in the sparkling Adriatic Sea lies the small island of Molat. From the moment you step off the catamaran onto your peaceful island home for 5 days, your senses will be awakened as your Adriatic immersion blooms! As we approach summer, Molat transforms into a bursting botanical garden; brightly colored flowers and wild fruits and herbs everywhere. The sweet scent of honey will linger on your nose long after you’ve gone. The crystalline waters that we’ll float over in our kayaks will inspire you, as we slow down and open our eyes to the intricate landscape of limestone, rosemary, and olive groves. The fascinating history and rich culture of the area will enrich your experience by providing context as you stroll the cobblestone streets of Molat. Be inspired to notice the impact within as we marry the laid-back island life with the quiet tranquility of the Velebit Mountains. Our goal is to reach the highest point of this rugged mountain range. Our final night in the beautiful Old City of coastal Zadar will be a celebration of each other and all that we’ve experienced. This trip is in collaboration with Venture Outside, an adventure company based in Maine. Join us for a trip that balances your sense of adventure by partaking in kayaking, hiking, biking, and SUP with discovering island and mountain serenity in the best of Northern Dalmatia, far from the crowds. DAY 1, ARRIVAL – ZADAR – MOLAT (June 1, Saturday): We begin in the lovely coastal town of Zadar, where we board a catamaran and take a 1-hour cruise on the Adriatic Sea to the small island of Molat. The island is divided into 3 small settlements (Molat, Brgulje, and Zapuntel, population of all 3 totaling about 200), connected by a single road. The village Molat will be our homebase for the next 5 nights. After settling into our locally-owned apartments we head down to the kayaks to personalize the gear, get a paddle orientation, and enjoy our first paddle. We will begin to scratch the surface of learning local history, as we take in our new seaside surroundings. Before a dinner of local favorites we will go for a 15-minute hike up to Straža, which rewards with incredible views of the island and surrounding area. Croatia is famous for its brilliant sunsets, and this is our first opportunity to partake in the evening magic of Northern Dalmatia. DAY 2, DUGI OTOK – SUBMARINE CAVES – ZVERINAC (June 2, Sunday): After a hearty Croatian breakfast we get to paddling! 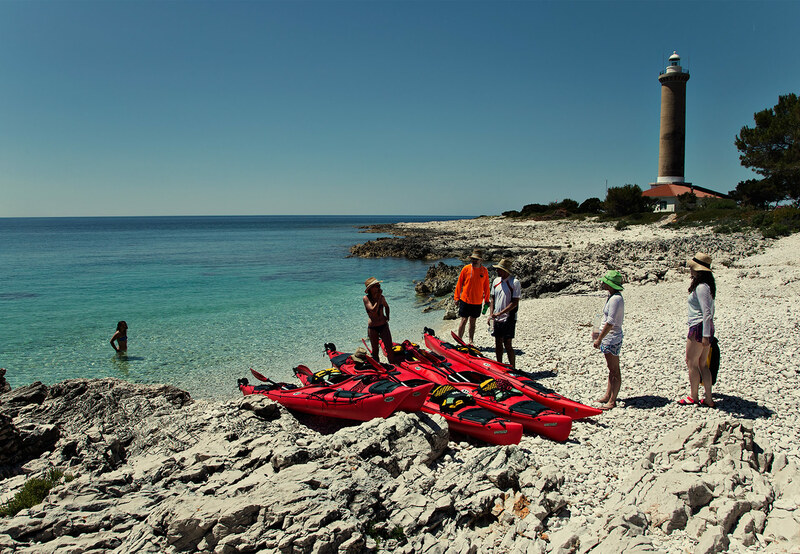 We’ll kayak to the 7th largest island in the Adriatic Sea, Dugi Otok, which in Croatian means “Long Island”. Inhabited since prehistoric times, we get a sense like we’re stepping back in time. We’ll learn ancient Croatian culture, as we explore the beautiful coastline. Next we paddle into ex-military submarine caves, a unique and exciting experience. After discovering the unique history of the caves, we’ll paddle to Zverinac, a small island in the archipelago covered in olive groves and flowers. We’ll sample its famous olive oil and learn traditional methods of making it. After lunch and a swim we paddle back to Molat for some relaxation before another delicious dinner showcasing local dishes. DAY 3, SHIPWRECK – VELI RAT LIGHTHOUSE (June 3, Monday): After breakfast we paddle to the open sea past island Golac and its cliffs. We will check out the wreck of the cargo ship Michelle (partially above water) and continue our paddle to Veli Rat lagoon, carrying the kayaks over a beautiful sandy beach. There is an optional extension to a nearby lighthouse, the tallest in Northern Dalmatia. This active lighthouse is a well-known landmark and sight to behold. So much so that it was commemorated in a Croatian postal stamp. We return to Molat following the coast of Dugi Otok. DAY 4, MULTISPORT DAY AND HIKE ON IST (June 4, Tuesday): After breakfast we activate our lower bodies as we take in the expansive coastal vistas from an 8km cycle to the village of Zapuntel. Here we meet our kayaks again and paddle to the island/town called Ist. After a short stroll through the town we enjoy better and better views of the archipelago as we hike to the scenic white Snow Lady Chapel. After lunch there is a possible kayaking extension to Škarda and exploration of rock formations around Ist. We paddle back to Zapuntel and drive (or cycle) back to Molat for some relaxation before dinner. DAY 5, SUP AND MULTISPORT DAY – MOLAT (June 5, Wednesday): After breakfast we have a fun introduction to stand-up paddling, where we learn essential strokes and do a short trip to a nearby island or cove for a picnic lunch.The afternoon will consist of stand-up paddling back to Molat. DAY 6, MOLAT – HIKE THROUGH PAKLENICA GORGE (June 6, Thursday): We bid farewell to island life on Molat. An early morning finds us back on the catamaran to Zadar. Here we do some brief shopping at the fresh food market to get a few supplies before heading inland to the gorgeous Velebit Mountains. The entire range is protected as a nature park, with Paklenica being one of two national parks within it. Velebit is the largest mountain range in Croatia and forms part of the Dinaric Alps. We enter the mountains through the town of Starigrad, where our hike begins. We move through Paklenica canyon, a hotspot for rock climbing, switching gears from sea level to rugged karst peaks, abundant in flora and fauna. Our destination and home for the next few days is the Paklenica mountain hut, nestled in a serene forest. We continue sampling different Croatian fare for dinner, while eating outside provides us special and breathtaking scenery. Early to bed for our big hike the following day. DAY 7, SUMMIT VAGANSKI VRH (June 7, Friday): After a hearty breakfast we start our big hike. We begin with 3-4 hours hiking through the Maquis and Oak forest to Struge Valley. Breathtaking views accompany us the entire day. We take a break and continue to the barren peaks of Velebit and ideally finish on Vaganski Vrh, the highest peak of the Velebit mountains at 5,764.4 feet. Depending on the conditions, we return to the hut by a different route. Back at the hut a well-deserved dinner awaits us. DAY 8, PAKLENICA – ZADAR (June 8, Saturday): After breakfast we pack our bags and hike down to Starigrad, where we are transferred back to coastal Zadar. We will settle into our accommodations in Zadar. The afternoon we’ll enjoy free time to stroll the scenic streets of the Old City, including the famous Sea Organ and cathedrals. There will be an option to join a city tour with a knowledgeable local guide. Zadar has many great restaurants serving local Dalmatian dishes, and dinner will be free to dine as you choose. DAY 9 – ZADAR – TRANSFER TO AIRPORT (June 9, Sunday): Enjoy a free morning in Zadar. We bid farewell and provide a transfer to the airport. What an amazing trip! Contact me for inquiries and to join this unique trip opportunity.